``Shawkl``: Artist Trading Card Swap -- Come Join in the Fun! Artist Trading Card Swap -- Come Join in the Fun! 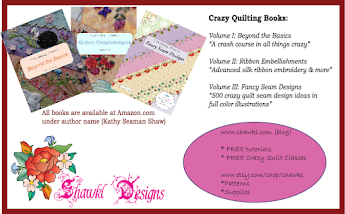 Have you seen the fun swap that Crazy Quilt Quarterly is organizing? It's open to anyone in the USA that follows the rules and submits on time! So, do you like to work on Artist Trading Cards? Do you like receiving little surprise in the mail (really who doesn't!). Not sure what an Artist Trading Card is? Well, it's simple...it's a mini-CQ block that measures the size of a calling card or business card. It has a finished edge (zigzag edge is fine), is built on a foundation (muslin, interfacing is optional but advised)...and is embellished. The back has an "information card" attached to it (per the swap guidelines). 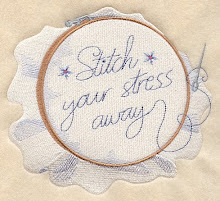 * Create a crazy quilted artist trading card (2 ½” x 3 ½”). It must be crazy quilted and it must be the stated size. 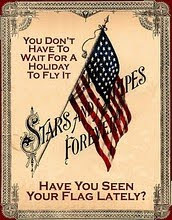 We ask that there be no politically themed entries (patriotic is fine). 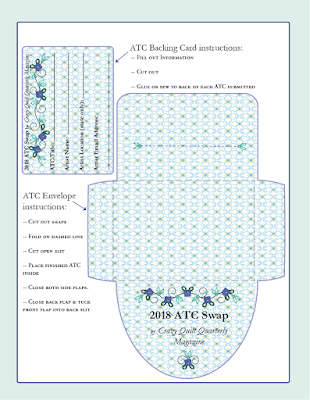 Be sure to include a separate SASE for EACH ATC you send! and also include your email address on each one so the recipient can contact you. and to receive her snail mail address. * Alas, we can only open this to residents of the United States. Deadline for receipt is January 31, 2018. 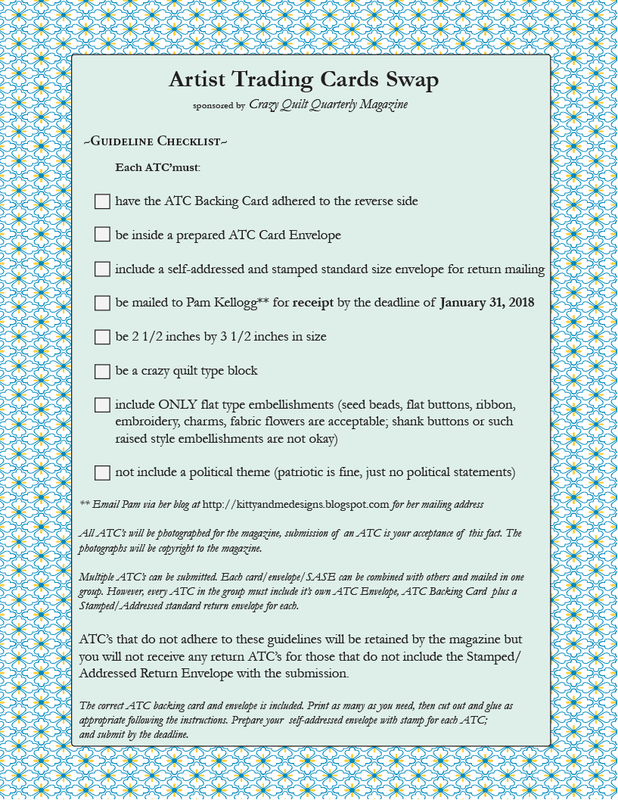 * As a further incentive Pam will photograph each ATC and they will be published in a special edition of the magazine….the date of which will be announced as soon as it becomes available. 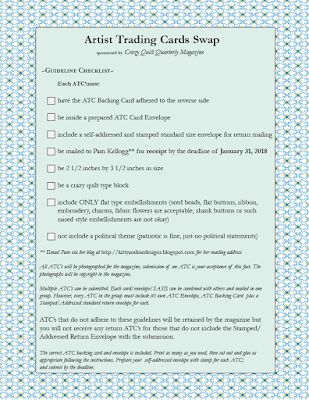 * Six of the ATC’s that we receive will be chosen for the cover. 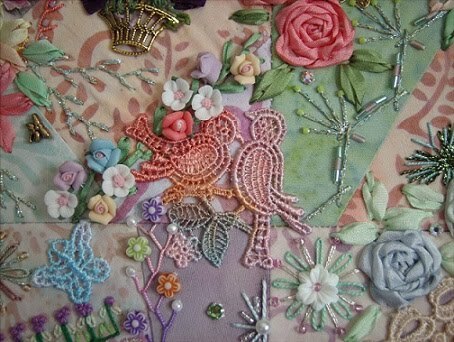 Those six artists will receive a prize - an extra ATC created by one of our staff members!! 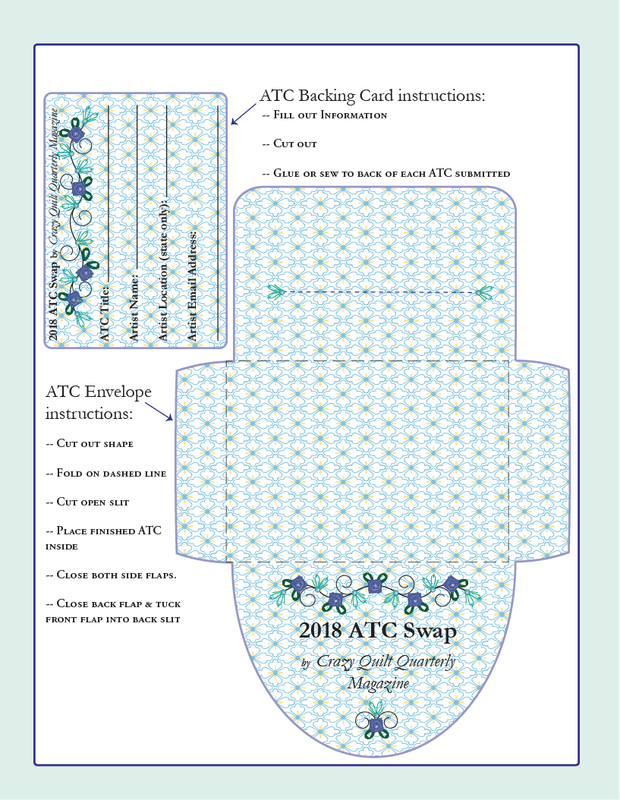 Have fun and let’s swap our mini’s – ATC’s CQ Style!! Be sure to either print the above images(fit to page size) or click HERE to download a pdf file. Either should fit on a standard 8 1/2 inch X 11 inch paper. 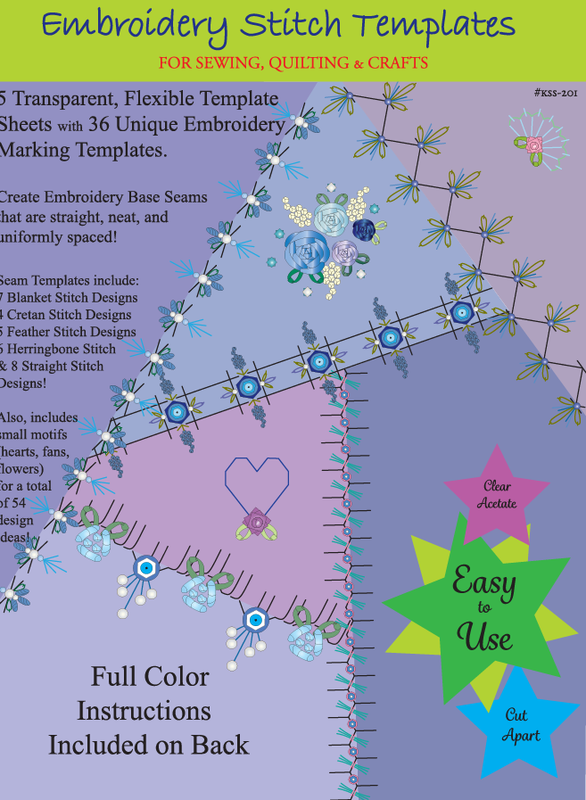 Use cardstock for the ATC back and the little ATC envelope! The magazine is hoping hoping to receive and trade at least 300 Crazy Quilt ATC's!!! Hope to see you join in the fun! Sorry to only be able to open this to USA folks...but perhaps if it goes over well...we can expand this idea next year to the international folks as well.